Seitz: Great Cast, Great Production Design. So Why Is Flowers in the Attic So Unsatisfying? Can we assume that an adaptation of a book that sold 40 million copies does not require a spoiler-sensitive review? We can? Good. The new Lifetime film of V.C. Andrews’s incesterrific novel Flowers in the Attic is a slight improvement over the 1987 version, yet still unsatisfying. This is maddening because it’s a rare project that, at a production level, has everything going for it. The fifties set design and costumes are handsome and persuasive, but never so distractingly perfect that the movie turns into a vintage warehouse with actors. The photography, by Miroslav Baszak (Land of the Dead), has an almost tactile richness, with light shafts cutting through the gloom of the cryptlike attic where the Dollanganger children are held captive by their grandmother. Mario Grigorov’s score is a resigned lament, mourning the cruelty and suffering you’ve seen and are about to see; then in tense moments it rises in pitch and intensity, until it sounds like music you’d hear at the end of a Brian DePalma picture that ends in voluptuous doom. The cast is just about perfect. Best in show would probably go to Mad Men’s Kiernan Shipka, who as Cathy Dollanganger is equally convincing as a budding young girl who trusts too easily and a wise-beyond-her-years abuse survivor who’s all resentment and coiled rage; Heather Graham as her mother, Corinne, whose porcelain doll face and Marilyn Monroe body at first seem too blankly typical, until her performance blossoms in increasingly complex and affecting ways; and Ellen Burstyn, whose empathetic performance turns what could have been a cardboard tormentor, grandma Olivia, into another wounded soul, a heap of brokenness who’s easy to fear but ultimately impossible to hate. (Burstyn’s tearful shrieks of “Help!” as Olivia is locked away in darkness are so powerful that I almost wish I could un-see and un-hear them.) But all the actors are spot-on, even ones who have just a few scenes. It’s a pity Kayla Alpert’s script and Deborah Chow’s direction don’t do their collaborators justice. 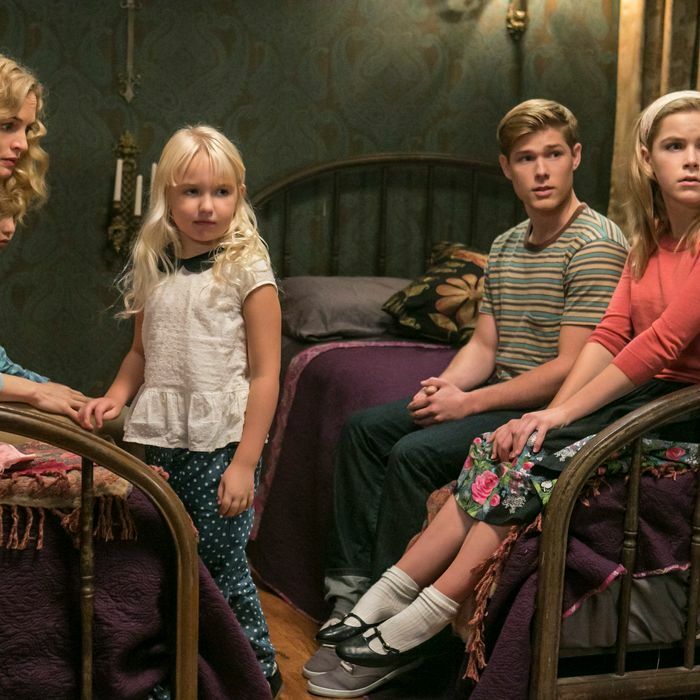 The problem isn’t that Lifetime’s Flowers in the Attic is bad; it serves the material, as they say, and does it with the straight-faced, workmanlike seriousness you’d expect from a high-end TV movie. The problem is that the source cries out for a somewhat unfaithful film adaptation, one that finds a way to amplify the novel’s story and themes (which made V.C. Andrews’s work so successful, I suspect) while pruning the tediously expository dialogue, or else playing it for high melodrama or camp (there’s a fine line between the two modes, granted — and that’s why they’re both so much fun). “It’s not easy for a woman to get a job and support four kids on her own,” Corinne tells Cathy. “Look at me, I’m an ornament. The only thing I was ever good at was being pretty.” That’s the sort of dialogue that Douglas Sirk and Joan Crawford would have known exactly how to stage, back in the day: straight yet inexplicably, invigoratingly twisted. This Flowers merely presents it, just as it merely presents its images and situations, too many of which don’t bore or offend but don’t exactly land, either. The entire tale hasn’t been imagined as daringly as it could have been. It’s intelligent and sincere and tasteful, but it lacks guts and soul. This is a story about generational cycles of abuse and the difficulty of escaping them. To its credit, this adaptation does get across the notion that there are really no villains in this tale, just victims with power and victims without. But there’s still something missing: a spark of filmmaking madness comparable to the awful charge that Burstyn generates when she she tells Corinne, “Your groveling bores me,” or repeats a threat to Cathy while shaking her fist and growling, “Or shall I speak … more … slowly?” At points, you may find yourself fantasizing about a wilder, less subservient adaptation, with a core of Night of the Hunter–style poetry. As I watched, I kept imagining what a David Lynch or Jane Campion Flowers might have looked like, then stopped because it was making me sad.